The maps on this page show the Commonwealth of Pennsylvania and the surrounding region. The first map depicts the state, highlighted in red, with neighboring states depicted in white. The detailed map includes parts of New Jersey and New York as well as portions of Delaware, Maryland, Ohio, and West Virginia. Both natural terrain features and man-made features are shown on the detailed regional map. 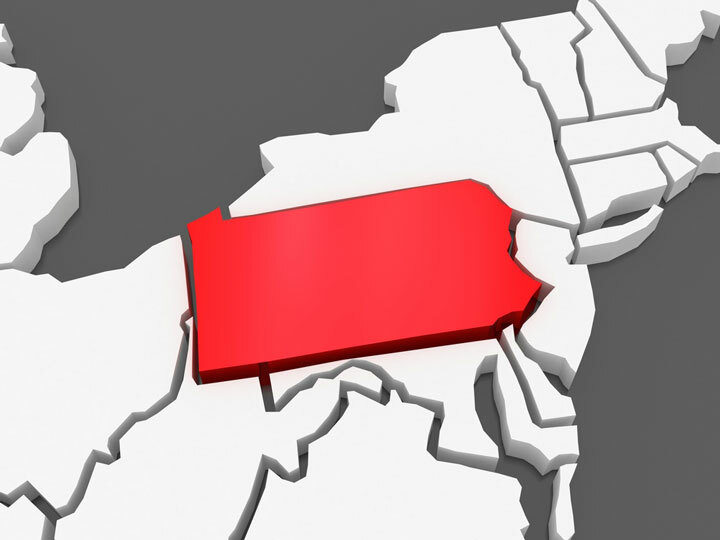 To zoom in on the regional Pennsylvania map, click or touch the plus (+) button; to zoom out, click or touch the minus (-) button. To display the map in full-screen mode, click or touch the full screen button. (To exit full-screen mode, click or touch the exit [x] button.) To scroll the zoomed-in map, swipe it or drag it in any direction. You may print this map of Pennsylvania and vicinity, or a portion thereof, for personal, non-commercial use. For improved legibility, consider printing the detailed map image on large, ISO size A3 or ANSI size B paper rather than ISO size A4 or ANSI size A paper. This Scale of Miles applies to the framed Pennsylvania map on this page, at its largest displayed scale.